In eInclusion, the main interest has traditionally been in granting interaction with ICT, i.e. the accessibility of interfaces. 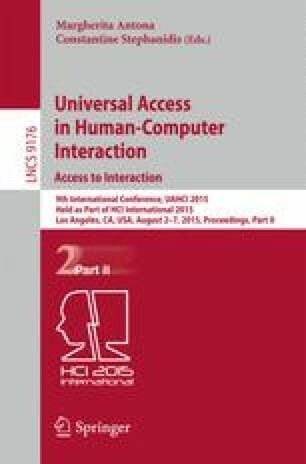 Due to the developments toward an AmI (Ambient Intelligence) information society, the technology of interest in accessibility and its integration in multimedia interfaces matched to the user requirements and preferences are becoming of interest for the general customers. Therefore, the point made in the paper is that the concept of eInclusion, as it already happened at the political level, should be generalized to include actions able to guarantee well-being. Therefore, it becomes necessary to collect knowledge about activities necessary for living comfortably and enjoyably, to identify and implement an ICT environment offering the functionalities to carry them out and to make available the quantity and quality of intelligence necessary to adapt the environment to different users and contexts of use.